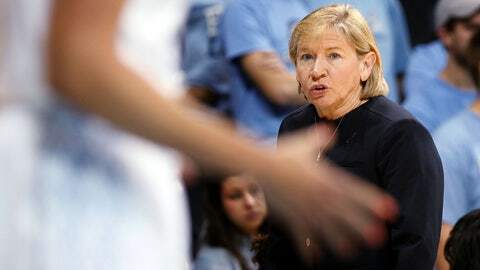 UNC women's basketball coach Sylvia Hatchell was diagnosed with AML, acute myeloid leukemia, in October. 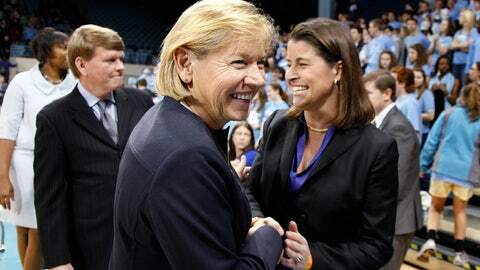 Last summer, Sylvia Hatchell had just signed the No. 1 recruiting class and her UNC team wasn’t ranked in the preseason. The Tar Heels finished 29-7 and got a No. 3 seed in the NCAA Tournament. She reached the 900-win mark in the previous season — her 38th on the job — and she was poised to be inducted into the Naismith Hall of Fame in September. As Hatchell reflected on what had been and what was to come, she turned to Sammy, her husband of 34 years, and said, "Something bad has got to be getting ready to happen." She was half-joking. Then, in August, she had a dream that bothered her. In it, she was sitting in the stands watching her team play. Why would I be doing that?, she wondered. She had only missed two games as a head coach, ever — one the day her son, Van, was born (in 1989), and the second two days later — and even then, she gave her team a pregame pep talk via speakerphone just two hours after giving birth. She was back on the sidelines after four days of rest to coach against Georgia Tech. Recovering from giving birth is one thing. But when she had that dream in August, she had no idea she was about to be up against something much bigger. It was a Friday night in early October, just a few weeks before Late Night festivities and exhibition season, when Hatchell received the phone call. "You talk about a tsunami hitting you." There had been over a month’s worth of blood tests showing her white blood cell count was alarmingly low with no answers as to why. She finally had an answer, but it wasn’t the one she wanted. "They told me the preliminary test was AML, acute myeloid leukemia," Hatchell said. "I was like, ‘What?’ Dr. (Pete) Voorhees, he said, ‘Coach, it’s treatable and it’s curable, but we need to get you in here and get our arms wrapped around this.’"
Sylvia Hatchell is the second-winningest coach in NCAA women’s basketball history, behind only legendary Tennessee coach Pat Summitt. All Hatchell could think about was her upcoming schedule. She had already set the Sunday practice for her team after Friday afternoon’s was over, and she had a number of promotional events and speaking engagements coming up that week. As she began to rattle off a list of events on her schedule, Voorhees stopped her. "Coach, you need to get in here, we need to get our arms wrapped around this." "Tomorrow?" Hatchell responded, incredulous. "I was in shock." Hatchell had known it was something bad, though. Like most coaches, Hatchell often overextends herself during the year, and this year was shaping up to be no different. She first heard about her low white blood cell count on Labor Day weekend. She didn’t think much of it, or of the warnings to not shake hands or eat raw fruits and vegetables. She saw a hematologist the next week at the request of her doctor. Still low. Same warnings. Only problem was, she being inducted into the Hall of Fame that weekend. There would be a lot of shaking of hands going on. She openly scoffed at the precautions. She returned from the inductions that next Monday, changed her clothes and got on an airplane to go recruiting — six home visits in five different states in six days. In the middle of the week, Hatchell called her doctor and told him her throat was sore. She had two visits scheduled in Atlanta the next day, so he gave her some steroids to reduce the swelling. She felt much better after that. Things were back to normal, or so she thought. "I was a little bit tired, but I’d been on the road," Hatchell said. "The whole month of September, I was home for like two days." But the counts were still low. She had been tested for an autoimmune disorder, or even a virus she could have contracted from being around college kids. Still nothing. On Oct. 2, yet another blood test came back with the same results. Only this time, she couldn’t dismiss it because she knew this was something else, something serious. In a daze, she walked out of her office and looked at her longtime assistant, Jane High. "Jane, I just don’t feel like everything’s connected," she said. "I’ve got something going on here." So she called a friend over at the UNC Lineberger Cancer Center. She’s donated quite a bit of money and time to it over the years, and been one of its biggest supporters. Hatchell wanted a bone marrow test. The test was done on Friday morning. She had her answer by Friday night. You talk about a tsunami hitting you. It was a good thing she did. "Acute" means it progresses quickly, and in most patients it’s fatal in a few months if left untreated. Her doctors estimated she’d had it for a month already. That didn’t make it any easier to hear. As Hatchell sits on her couch, sunlight streams through her open windows, lighting up her mostly Carolina blue decor. The sun reflects off of the pond in her backyard. 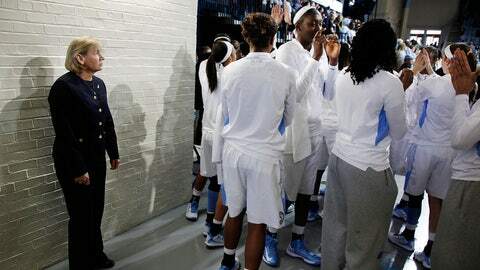 She wears a white UNC women’s basketball T-shirt over navy warm-up pants and oversized UNC sneaker slippers. A stocking cap covers her bald head. An enormous golden retriever named Maddie keeps watch from the floor on one side, resting its head on top of huge, furry paws. "She lays right up here beside of me. I don’t move without her beside of me. Right, Miss Maddie? Want to come here?" Maddie lumbers up, tail wagging, and gets scratched behind the ears. "She’s great. She’s my best buddy. I picked her out when she was five weeks old." The serenity outside gives way to a chaotic scene inside, where people are constantly coming and going. Whenever a car pulls up, there’s a loud, ringing alert. She has a nurse that cooks — she’s on a special diet — and takes care of her. The UPS man shows up at least once a day. Some of the deliveries are from well-wishers, but quite a few are for her. There are 3-4 catalogues strewn at her side, opened to the latest item she was thinking of buying: cushions. A Bose sound system had just come in. The UPS man arrived yet again bearing gifts — this time, rugs for her staircase for Maddie to be able to keep her footing better as she climbs up and down. She’s still waiting on a rug for her front entranceway and new bedspreads for her cabin in the mountains. "I’ve never stayed home this much in my life. I’m cleaning out closets. I’m cleaning up drawers. I’m ordering stuff in the catalogues," Hatchell said. I’m telling you — these catalogues and my credit card, it’s dangerous." Her plumber shows up to fix a busted hot water heater. Her friends and family show up to check on her. Staffers come by to provide team-related updates. A rotating group of girlfriends stay with her almost every day and night, making sure she is never alone. It’s been like that since the diagnosis. Hatchell directs traffic as best she can. "This place is wild all the time. So you can imagine whenever everybody had to put on masks and we had to not let people in or let them come through the basement," she said. "This place is like a three-ring circus all the time." A pink, printed piece of paper is in between her catalogues. It says, "As we face different situations, we should remember God is sovereign over both the blessings and the troubles that come our way. He desires to use everything to build our character. He uses both good and bad to transform and guide us on our journey." "I do this little devotional thing. I printed this off because I thought, ‘This is how it is’," Hatchell said. I know God’s got a plan here. I told God a long time ago, ‘Look, I’m all yours. Do what you want to do with me. Use me how you want to use me.’ I feel honored and privileged for the fact that he would consider using me." Hatchell felt like she had done all she could to avoid getting a disease like this. She ate right. She worked out a lot, doing cardio in her house and strength training regularly each week. Yes, she’s 61 years old. But she’s as healthy as a lot of 30-40 year-olds, if you ask her. She’s never wanted to know the why; she just wanted to know the how. They’ve checked almost everything — genetics, exposure to radioactivity or pesticides, smoking. None of those applied to her. The doctors told her it was random, and that’s a good enough reason for her. She isn’t feeling sorry for herself. But she does want to feel like she’s in control. That’s been her biggest struggle. 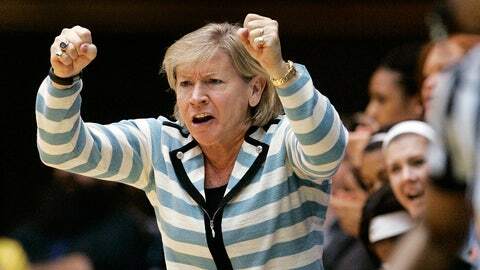 Hatchell was inducted into the Naismith Basketball Hall of Fame in September. A phone call early in the process from ABC’s Robin Roberts, who has had cancer twice, including a similar type to Hatchell’s the second time, helped her see the big picture: "She said, ‘Sylvia, you’ve got to learn to take your hands off the steering wheel.’" Hatchell has known Roberts for a long time, and she knew immediately what Roberts meant. Both are strong, powerful women. She knew Roberts, of all people, could sympathize. Right away, she started chemotherapy. She had a double port put in Sunday morning, one that steadily streamed her everyday chemotherapy and the other for a stronger medication she took at night — "It was so strong that they would put on like these radioactive suits to give it to you. It looked like motor oil with a little more red in it." She refused to wear a hospital gown, instead choosing either the outfit she was wearing or basketball shorts. Always the slippers, though. She refused to lie in the hospital bed unless she was sleeping. She would sit in a chair instead, or stand up and move. Moving has been a big part of her taking control, too. She’s always been active and she didn’t want chemotherapy to change that. So she began working with Dr. Claudio Battaglini, an associate professor at UNC’s exercise and sports science department who also heads up the "Get REAL and HEEL" Breast Cancer Program, which is one of the ways he’s studying the positive effects of exercise on chemotherapy patients. It sounds insane to think of patients getting their immune systems wiped clean, basically, working out. But Hatchell was determined. The two took Sundays off, but every other day, she at least did something. Even if it was just walking 10 laps in the morning and 10 more in the afternoon (17 laps is a mile) at the Lineberger Cancer Center, pushing her IV stand as she went, slippers shuffling along, she did something. "Most of the days, I’d walk and do strength training. It would depend on how my numbers were. Whenever my platelets would get really, really low, I would not do the weights as much because of possible internal bleeding with the joints," Hatchell said. "When your platelets get low like that, you can’t be bleeding. But even when I felt bad and didn’t feel like doing anything, I would work out. I always felt better." Her initial round of treatment lasted about four weeks. Now, with one consolidation treatment completed, she has three more to go, mostly as a precautionary measure, she says. "We actually just did a bone marrow last Monday and it was clean, clear, clean. So these consolidation treatments are really just to make sure it never comes back," Hatchell said. "They say I’m doing great and they’re expecting this to be enough." From the time she went into the hospital, she only weighs eight pounds less right now. There are days she says she feels as good as she did before she went into the hospital. Now, it’s just a waiting game. Perhaps even more difficult than Hatchell hearing the news was having to tell those close to her. Sammy was out of town at a coaching clinic, so, instead of breaking the news over the phone, she told him to come home after that and take her over to the hospital. She called Van, who was running a road race in Raleigh, and told him to come by around lunch. The only people she could tell right away were her staff members. She called them Friday night — Andrew Calder (a long-time assistant and interim head coach), Tracy Williams-Johnson and Jane High. First-year assistant Ivory Latta was out of town, as was director of basketball operations Greg Law. "They were just like, ‘What?’ There were some tears and all," Hatchell said. "I said, ‘Guys, look. It is what it is. I’ll fight it. I can take care of this. We’ll be all right.’ I said, ‘Andrew, you’ve been with me 27 years. You know exactly what I want done.’ And we already had everything planned out for the year, really." Sylvia, you’ve got to learn to take your hands off the steering wheel. She had practice scheduled for Sunday afternoon. Instead, Calder told the team that they were going over to the Cancer Center. It wasn’t uncommon for them to do that anyway. But when they saw Hatchell walk into the boardroom with a mask on, they knew something was wrong. She told them what she knew, which wasn’t much. Just that she had a blood disease and she had to get treatment, and that she’d be out awhile. They’re a very young team and hearing a word like "leukemia" scared them. The players wanted to hug her. They wanted to help. But there’s not much they can do. As they worry about her from afar, she just wishes she could be there with them every day and help them grow. She watches every practice and every game, giving Calder her thoughts and input as often as she can. She talks with the girls by phone and text. And every now and then, she brings them over to her house. Hatchell listened in frustration as her team lost a game to Arizona State in a Cancun tournament over Thanksgiving as sophomore Xylina McDaniel got her third foul, and then a technical foul. McDaniel has developed a reputation for being a bit of a hothead, but Hatchell knew she was still young enough to change people’s minds. She called McDaniel over to her house, reminding her of all the things she’d done to improve her game in the offseason. But she had to learn to control herself. So Hatchell gave her young post player a rubber band to wear during games. "I said, ‘Wear it around your wrist. When you’re out there and you’re getting so emotional, just take the rubber band and just pop it. When you do that, it will refocus you on what you need to do and you get control’," Hatchell said. "The next day, she had her career high, I think, at halftime. I think she only had a couple fouls. She hasn’t fouled out since then." Depending on her counts, Hatchell can occasionally go to pregame meal. She was able to attend a game in person for the first time last week. The team traveled to Myrtle Beach in late November week for a few games — an annual tradition for them — and Hatchell went to see the bus off. She had to restrain herself from jumping out of the car. "Is it hard for me?" Hatchell said. "Honey, you can’t imagine. … You don’t realize how much something means to you until you don’t have it anymore, especially when it’s taken away from you like that." Admittedly, there are times when she’s scared. There are times when she is just tired of being at home, or feeling sick, or not being with her team. There’s a little bit of worry in the back of her mind that she won’t find a bone marrow match. Her three siblings aren’t matches, and they have yet to find one in the database, though she will not need a transplant if she remains cancer-free. Hatchell says she is undergoing consolidation treatments as a precautionary measure, but that she is cancer-free as of her latest bone marrow test. The exercising has helped Hatchell keep a positive mentality, as has her faith. Her doctors have, too. They told her almost to the day when she would lose her hair. When it started falling out, Hatchell called her regular hairdresser to come over and shave it off. Her doctors and nurses came into the room and made it into a party. First, her hairdresser gave her a Mohawk, then a rat’s tail, before it all came off. They took pictures and laughed as the hair dropped to the sheet below. The doctors took it a step futher, painting "Go Heels" and drawing a Tar Heel foot on the back of her bald head. "I’ve been coaching long enough to know that the mental aspect is major, major, major, major," Hatchell said. "Success is about a mentality that you choose to have. It is. I tell the players all the time, winning is a mentality. And it’s a mentality that you make a decision that you’re going to have, that you decide to have. Just like when they cut my hair off, I could’ve sat there and cried, but we had a party. I know it’s going to grow back. It’s already starting to grow back a little bit. You can see it coming through." Of the gifts people have sent Hatchell during this process, many are hats or caps. She makes use out of the headgear, but when she’s not wearing them, she stores them in an unconventional place: on her Naismith Hall of Fame trophy. "I don’t think that’s ever been used for a hat rack," she said with a laugh. Patience does not come easy, though. Even as she sits on her couch, she can’t seem to stop moving, slowly circling her slippered foot or rubbing her hands together. She’s used to being on the go. Being forced to be at a complete stop is still a new experience. There is no timeline on her return, and that might be the most frustrating part of all. But then she and the doctors were able to agree on an analogy that made sense to both of them: her team has a preseason, then exhibition games, and those tell you about non-conference games, which in turn tells you about how a team will do in conference play. And that determines your ACC Tournament seeding, which determines your NCAA Tournament seeding. In other words, it’s impossible to know what lies ahead without knowing how each step will go. You don’t realize how much something means to you until you don’t have it anymore, especially when it’s taken away from you like that. "Of course, in my mind, I’m thinking ACC Tournament, NCAA, but he hasn’t said that. My doctor hasn’t said that. He just says, ‘We’ve got to wait and see how you do,’" Hatchell said. "… You don’t realize the things that are special and important to you until that’s all you have. And you don’t realize how strong you can be until that’s all you have. There are times when you’ve just got to make a decision — am I going to be strong through this, because that’s all I have right now."